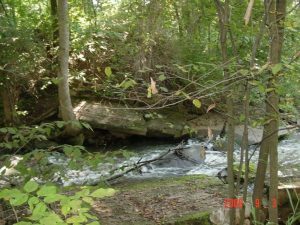 High Bank Creek has a long and interesting history. Here is a quick look at some of the major events on High Bank Creek and Barry Conservation District restoration efforts. 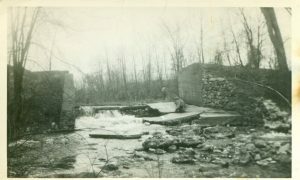 The project site featured a dam and an operating grist mill in the town of Morgan. The family of current landowner knocked down the former dam’s cement abutment as a safety precaution. Remnants of the walls remained in the creek, causing changes to the creek’s natural structure and function. 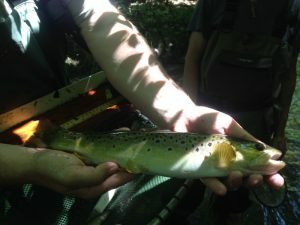 A DNR electrofishing study of High Bank Creek confirmed the presence of 25 fish species, including brown bullhead and grass pickerel, but indicated that fish abundance among all species was low and that brown trout recruitment was also low. An unpublished DNR survey of the creek reported only 15 species. Among the absent species were brown bullhead and grass pickerel. 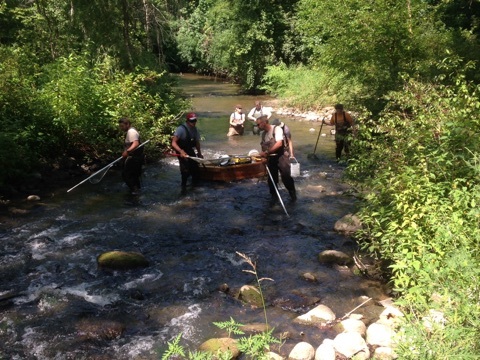 A DEQ Biological Survey rated High Bank Creek at Bivens Road excellent for macroinvertebrate community. Major flooding caused massive bank erosion- widths of 2’-5’ at 2’-3’ depths- in the unstable channel above the Morgan Dam. 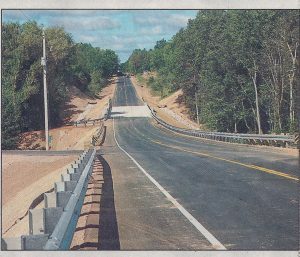 The 8’ Lawrence Rd culvert was replaced by a 35’ bridge which allows the stream to flow at bankfull width. Project partners: MDOT, BCRC, USFWS. The remnants of the Morgan Dam were removed (USFWS grant). Two perched and undersized culverts along the creek were replaced with appropriately-sized culverts (MDNR grant). 1200’ of streambank was restored along the creek with funding from MDNR. Substrate, macroinvertebrate, and fish passage studies were conducted. REad Final planting was done on the High Bank Creek restoration site. The High Bank Creek Restoration Project was featured in some articles, check it out! 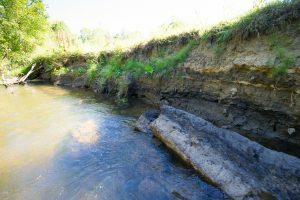 While the efforts on High Bank Creek aimed to naturalize its structure and flow as well as improve wildlife habitat, the project also provided an enriching opportunity to research the impacts of conservation practices on stream ecology. Grand Valley State University (GVSU) undergraduate students Olivia Cooley and Nick Preville received funding through the Pierce Cedar Creek Institute (PCCI) Undergraduate Research Grants for the Environment program to spend the summer collecting and analyzing fish and macroinvertebrate data from High Banks Creek. Michigan DNR crew, along with GVSU students and BCD staff, capture and mark fish along the creek to monitor improvements in fish passage before and after the project. Preville, a 2013 graduate of Bath High School, commented on how beneficial the field experience was for professional development. Although construction was completed in September 2015, BCD will continue to partner with GVSU professor Dr. Eric Snyder and his students to monitor the creek for several years.